Good training must have a purpose. The reason corporate firms go through the rigmarole of training employees is to make their employees better at what they do. But all training does not necessarily follow the above equation. In fact, training can go completely wrong. The only way one can measure the success (or failure) of a training program is by evaluating it. Evaluation is a process that critically examines a training program and determines its success or failure. Data is collected and analyzed, and its outcomes are measured. The evaluation judges how good the training program is and allows trainers to decide if (and what) changes must be made to it, in order to make it more successful. A training program is deemed successful if the evaluation proves that learning has indeed taken place and learners have benefitted from the training. Of these four models of evaluation, the most successful one is the Kirkpatrick’s Model of Learning Evaluation (In fact, the Anderson’s Value of Learning Model is based on Kirkpatrick’s Model of Learning Evaluation). 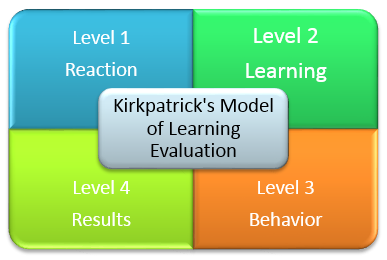 The Kirkpatrick’s Model of Learning Evaluation is the oldest model of evaluation used by the eLearning Industry, and is now viewed as the global standard for evaluating the effectiveness of learning. The model has been around for over 50 years now and has been tried and tested again and again – and again, only to be proved to be an extremely reliable method of evaluating the effectiveness of an eLearning program. The advantage of Kirkpatrick’s model is that it can be used to evaluate both traditional classroom training and eLearning. Measuring evaluation using the 4 levels of evaluation can give organizations an overall perspective of their training program and of the changes that must be made. This model has been used to gain a deep understanding of how eLearning effects learning and if there is a significant difference in the way learners learn. There have been some controversies regarding this model, with some people believing that this model needs some more levels such as a fifth level that will measure the ROI. It’s surprising that with the benefits this model can lend to a training program, only a small percentage of organizations actually go through the trouble of measuring the impact of learning on their employees. Almost all organizations measure the reaction of a training program and find out how their employees liked the training program (level 1), but less than 40% actually go through the trouble of measuring business results. In my following blogs, we will look at the different aspects of Kirkpatrick’s model of evaluation and how organizations can use it to their benefit.